Good morning friends~ Birgit here! 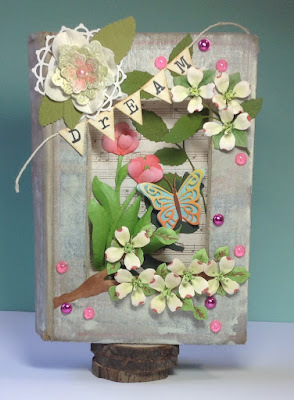 I have an altered book project to share with you today for the Dies R Us Inspiration Blog. This project sort of evolved as I didn't start out wanting to create an altered book. It started when I got these new Elizabeth Craft Dogwood and Tulip dies. 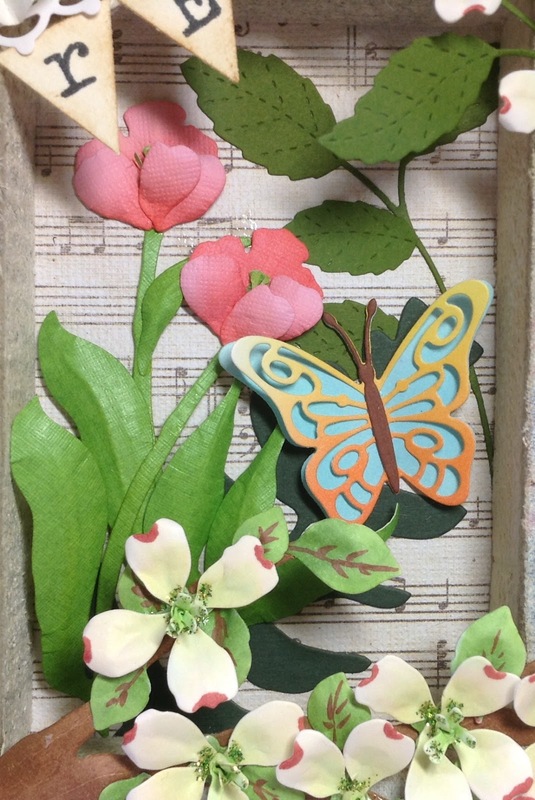 I created the Dogwood flowers and branch first and thought they were so beautiful, I wanted to come up with another project to showcase them all and I just happened to have this shadow box book in my closet of UFO's (Unfinished Objects). So this is the end result. I'll start with the Dogwood. These flowers came together quickly and easily. I cut everything out using white card stock and colored them using Copics. I added some light green stickles to the ends of the stamen and around the bottom of the stamen to add shimmer and detail. Next I created the Tulips which I cut using colored card stock and just added on some shading using distress inks. 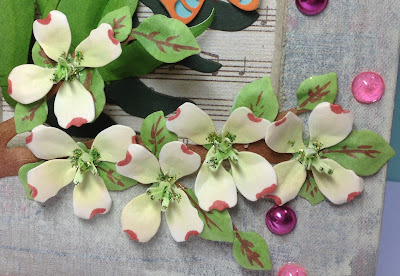 I found video's online from Susan Tierney Cockburn (the designer of these amazing flowers), on how to form the flowers and leaves and how to put them together. Again, very simple!! 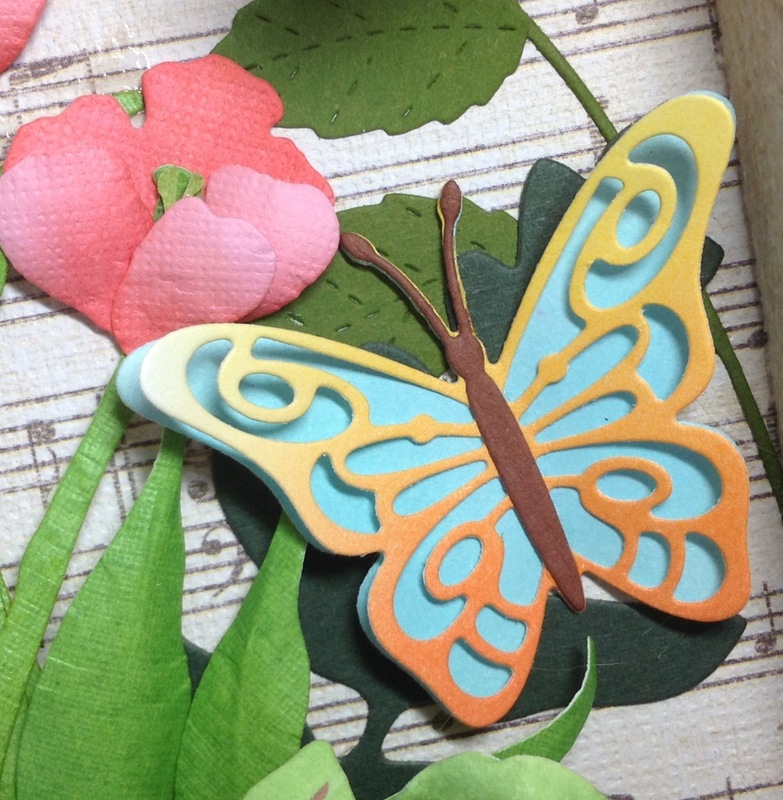 The butterfly is the small butterfly from Elizabeth Craft Designs. I simply blended some distress inks onto white card stock before cutting out the pieces of the butterfly and then layered it together. You can see a cluster of leaves in the background from Poppy Stamps called Hampstead Stem. There's also a really old Spellbinders Fern in the background cut out of dark green card stock. Moving on to the banner, I cut that using PTI's Heart 2 Heart and used a typewriter font to stamp the letters. 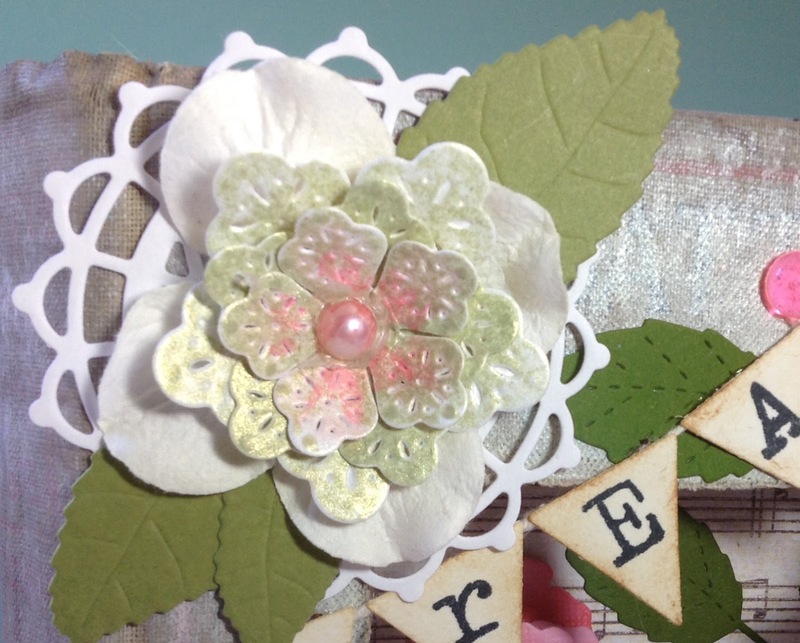 The top flower cluster uses the center of Cheery Lynn's Nautical Wheeler Doily. I added a silk flower and a flower cluster that I got from a stamper friend in a flower swap we did a while ago. The leaves are MFT's Royal Leaves, cut out of green card stock. The colored gems are called Lovebird Tear Drops from The Robin's Nest. That completes my project for today! 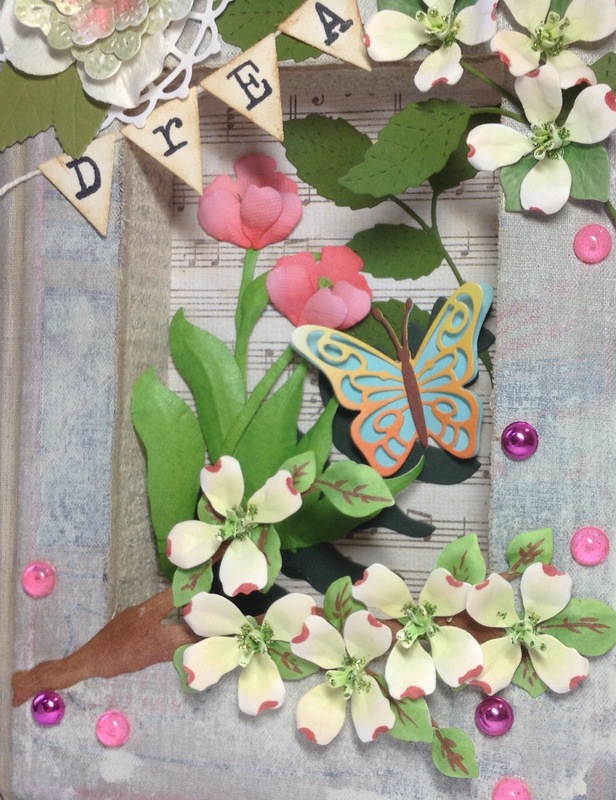 A stunning project Birgit, a beautiful work of art! 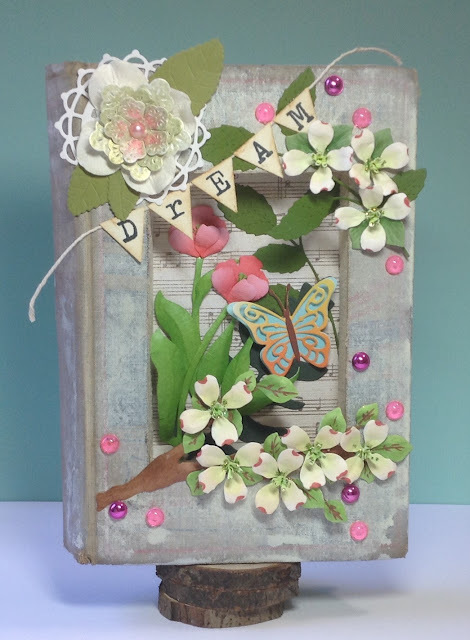 You have combined the different dies beautifully, and the colours of the whole book are just gorgeous. Wow, Birgit, that is an amazing work of art. You can tell you put a lot of work into it, making all those beautiful flowers. So elegant and beautiful, love all the flowers, great detail to them and love the banner to give it a title!! Wow...wow...WOW! This is AMAZING, Birgit! From all of those different and beautiful flowers, I think the Dogwoods are my favorite, to that fantastic butterfly, this is fabulous! I also adore that Dream Banner....wow...just WOW!